Visibility for investors and analysts is clouded in the memory market based on less than stellar guidance by Micron Technology and a concerning pre-preannouncement by Samsung Electronics. Micron Technology CEO Mehrotra's positive outlook for a recovery in 2H 2019 is the primary source of data investors and analysts have to base prognostications. Based on Mehrotra's positive outlook, I present eight charts illustrating the similarities and differences between DRAMs and NAND for four different financial indicators. Samsung Electronics (OTC:SSNLF) is set to report preliminary Q1 operating results on April 5. This comes after a pre-preliminary announcement on March 27, in which the company warned that operating profit will miss consensus due to an unfavorable business environment for the display and memory semiconductor businesses. 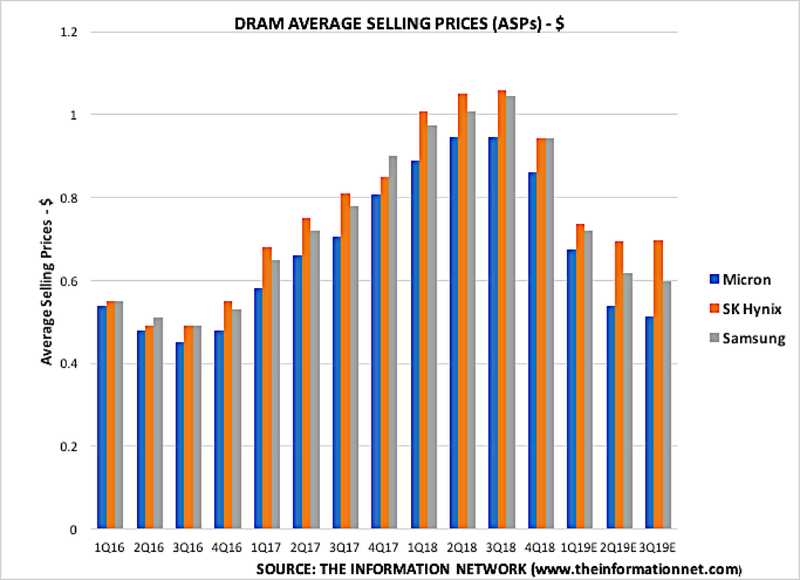 DRAM prices will fall 22% q-q and NAND prices 28% q-q in 1Q (vs. our previous forecasts of 22% and 25% declines, respectively). DRAM operating margin is likely to come in at 50% but may slide lower depending on some provisioning or cost recognition. 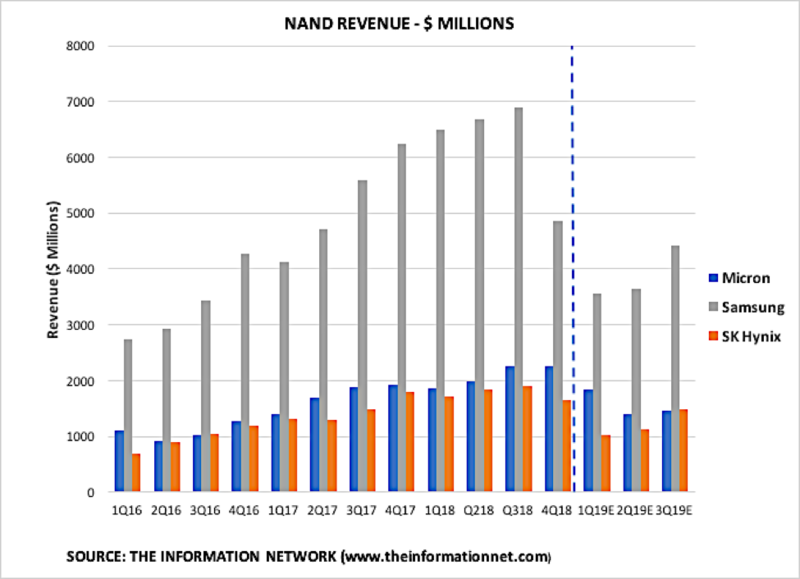 The NAND business should break-even. 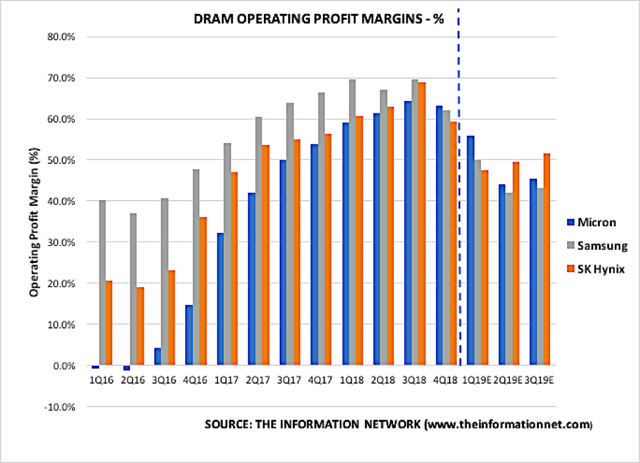 DRAM: DRAM was down 28% Y/Y in Q2, a 30% drop Q/Q. ASPs were in the low 20% range compared to the -17.9% estimate. Bit growth dropped in the low double digits (consensus: -9%). NAND: Revenue fell 18% Q/Q and 2% Y/Y. Bit growth was in the upper single digits compared to the -12.5% consensus. ASPs were down in the mid-20% range, below the -18.1% consensus. Thus, a common thread ran through both statements for the quarter. Yet MU’s stock jumped after its earnings call but dropped after Samsung’s release. It’s All About Guidance So What’s The Problem? Since it was just a pre-preannouncement, Samsung did not give guidance for CY2019. But here’s the problem. The entire memory industry is relying on MU’s guidance, not only for this recent quarter but for other public comments by the CEO that memory demand will pick up in 2H 2019. On the other hand, the memory industry seems to be running on empty thanks to negative reporting by DRAMeXchange, which has become the de facto standard for memory pricing. But it begs an important question. Although we don’t know how and from whom DRAMeXchange gets its information, it is a lagging indicator and any forecasting by the company, or any analyst for that matter, is merely an educated estimate. Unfortunately, DRAMeXchange has been making forecasts, and these forecasts have been picked up by sell side analysts and used in their notes. Look under a chart in an analyst report on memory and you will likely see a reference to DRAMeXchange. There are many investors that will argue with me about the reasoning and basis for the remarks made by Mehrotra based on comments on MU threads. But the fact of the matter is we have really only one defining source of information on the memory market who has his ear to the ground and that’s Mehrotra. Yes, there are macroeconomic issues such as China trade or a pending recession due to inverted yield curves or other chart data that could impact his forecast, but the only genuine source of real data is Mehrotra. So, despite some claims that he is a pumper of his stock, we don’t have another definitive source. I’ve been analyzing the semiconductor space since I started The Information Network in 1985, but I’m not out there beating on doors of server or smartphone or car companies like MU's sales people. Yes, I’ve analyzed the semiconductor demand for 5G, AI, ADAS, and Cloud Servers, all the next-generation technologies that are set to propel memory growth in my report “Hot ICs: A Market Analysis of Artificial Intelligence ((NYSE:AI)), 5G, CMOS Image Sensors, and Memory Chip.” But I don’t eat, drink, and sleep memory chips like MU personnel. The charts in this section are based on the recent earnings call for MU, previous earnings from all three companies, and the pre-preannouncement from SSNLF. I have also incorporated factors such as end-application market sizing and forecasts, and customer base of memory suppliers which impacts product mix and thus financials. Chart 1 shows DRAM revenues by the three major manufacturers MU, SSNLF, and SK Hynix (OTC:HXSCL). The horizontal axis is based on CY and includes MU’s FY quarter closest to the CY quarter. To the left of the dotted line I show historic CY Q4 data for SSNLF and HXSCL and MU’s FY 1Q. Data is already in for MU’s FY 2Q, which is shown as Q1 2019. 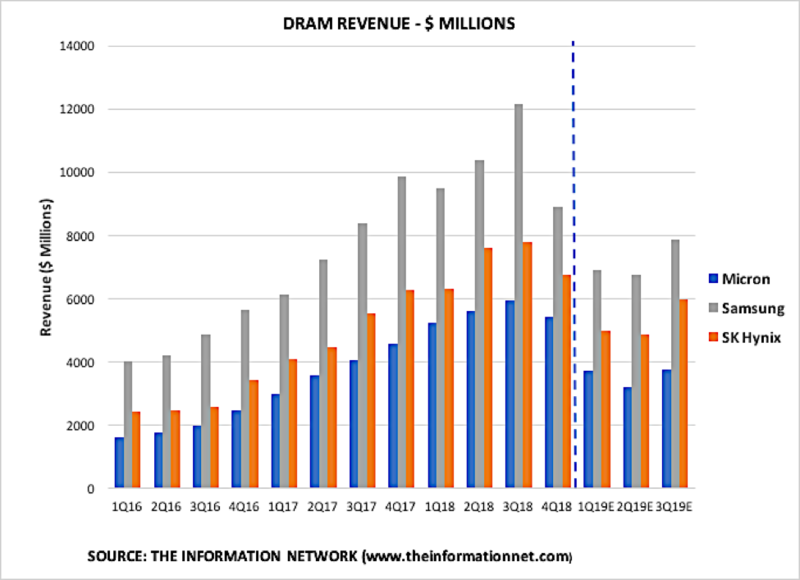 According to Chart 1, next quarter (2Q 2019) marks the low point in DRAM revenues, which will then show positive growth in Q3. Chart 2 Shows DRAM shipments for the three companies. Q1 2019 marks the low point in bit shipments, indicating growth in the next quarter. The difference in upturn between revenues (Chart 1) and shipments (Chart 2) is average selling prices (ASPs), which continue to drop in Q2 and, in fact, through Q3, as shown in Chart 3. We see a slowdown between Q2 and Q3 following steep drops between 4Q 2018 and Q2 2019. Chart 4 shows that the slowing in ASP drop combined with large growth in bit shipments will result in continued positive operating profit margins and an increase in OPM in Q3. The NAND sector shows some similarities to DRAM, but some significant differences. Chart 5 shows, like DRAMs, that revenues will recover in Q3, although based on product mix, Samsung and SK Hynix may show modest positive growth beginning in Q2. 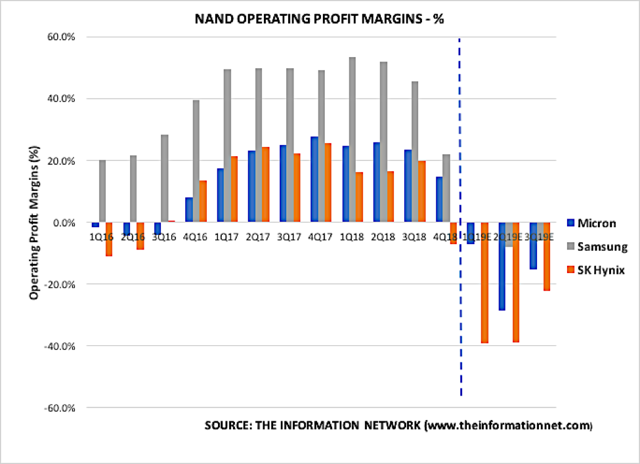 Revenues for all companies from their peak in Q3 2018 will drop 50% for NAND, compared to 40% for DRAM. 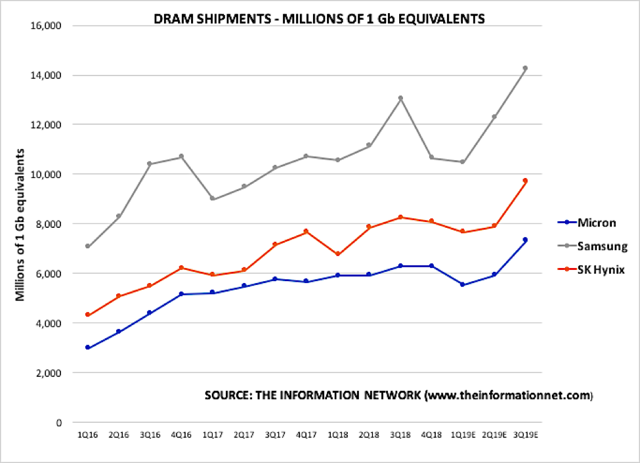 Chart 6, illustrates that like with DRAM, NAND will begin to exhibit positive growth in bit shipments in Q2 2019. Thus, Q1 2019 marks the low point in bit shipments, indicating growth in the next quarter. 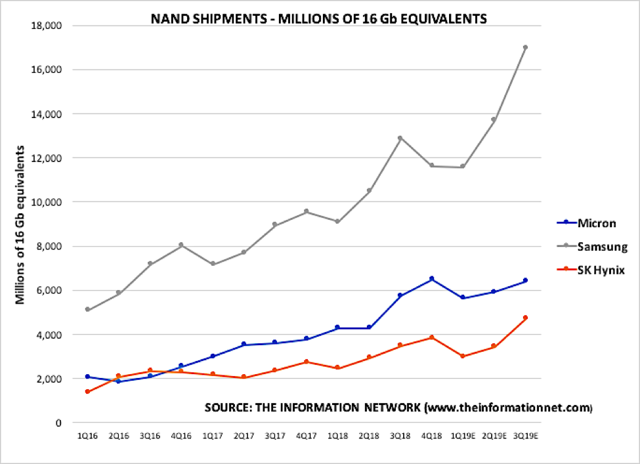 However, NAND bit shipment growth will be more moderate for NAND than DRAM (Chart 2). Chart 7 shows NAND ASPs. Unlike DRAMs, which reached a high point in Q3 2018, the high point in NAND ASPs was reached in Q1 2018. Also, NAND ASPs will drop 50% from their high, compared to 40% for DRAMs. The result of continued pressure from dropping ASPs and moderate NAND bit shipment growth will result in negative OPM for all three companies, as shown in Chart 8. On the hypothesis that 2H will mark the upturn in the memory market, I’ve presented eight charts illustrating the similarities and differences between DRAMs and NAND for four different financial indicators. ASPs were the key to growth of the memory market in 2017-2018, which positively impacted the stock of MU and its Korean oligopoly partners. The combination of strong bit shipment projections and slowing ASP erosion will result in positive OPM. 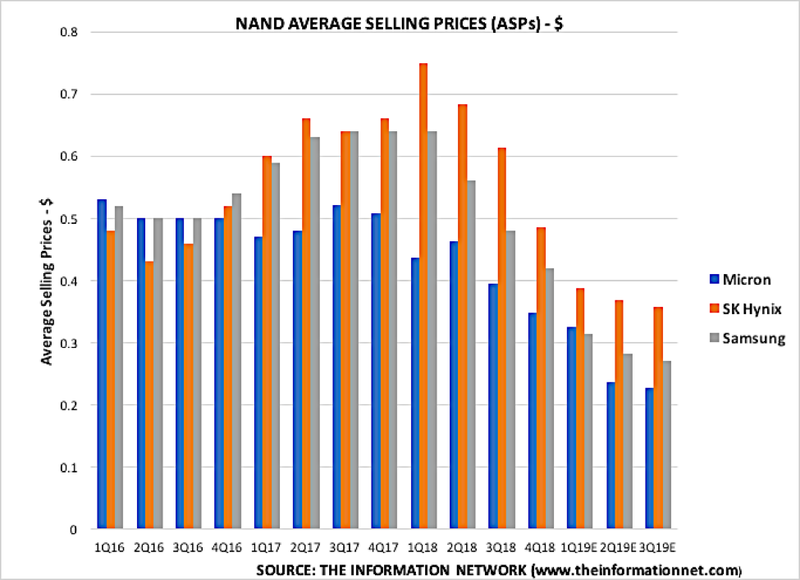 Not so for the NAND sector, where a combination of moderate bit shipments and significant ASP erosion (longer period and deeper retraction) will negatively impact NAND OPM to a significant degree. As I discussed above, the premise of this analysis and hypothesis is that a recovery will take place in 2H 2019, as per the statements of MU’s CEO Mehrotra. Macroeconomic factors need to improve, particularly the China trade problem. An important customer segment is cloud servers. Inventories at server customers have diminished, but actual purchases have thus been limited.